We’ve asked authors of books that were recently reviewed in the Oral History Review to answer 5 questions about why we should read them. 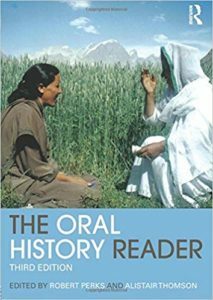 In our latest installment of the series, Alistair Thomson discusses The Oral History Reader which he co-edited alongside Robert Perks. Read the review by Sarah Milligan in OHR. The Oral History Reader is the standard international anthology of English-language writings about oral history. Two earlier editions were published in 1998 and 2006, and this third edition in 2016 includes an updated selection of 43 of the best writings from all over the world about oral history theory and practice, arranged in sections about Critical developments, Interviewing, Interpreting memories, Making histories, and Advocacy and empowerment. The book matters because it enables oral history students and practitioners to keep up with cutting edge approaches and debates in oral history. It also matters because it enables oral historians in any one country – such as the United States – to learn from new ideas and best practice in other countries. The book is oral history! Every contribution is an article or book chapter about oral history, and many of them include extracts from oral history interviews as well as examples of oral history projects. The Oral History Reader. 3rd Edition. Robert Perks and Alistair Thomson (eds.). London: Routledge, 2016. 722 pp. I love turning up at a stranger’s door to start an interview, never knowing what it will be like or how they will respond, always having to think on my feet about that person and their life story, almost always discovering extraordinary aspects of so-called ordinary people’s lives. And I love that oral history interviews can often transform historical understanding and can generate engaging, innovative and accessible history in multiple formats. Because we all need to keep abreast of developments in our field, and we all need to read and learn from oral history in other parts of the world and from many different oral history contexts (from academic research in many disciplines but also from community work and the media, from museums and activists, professional historians and archivists). Because it’s a great resource for teaching oral history – I have used the Reader for many years, ever since I decided in the early 1990s that I was sick of photocopying articles for students and agreed to work with Rob to make the Reader. I hope (and I know) they’ll remember some magical oral history writing, whether it’s Sandro Portelli writing about what makes oral history different, or Katherine Borland writing about how her grandmother challenged Katherine’s interpretation of a story about a horse race, or Erin Jessee writing about when oral history is too dangerous to share, or Janis Wilton showing us how to work with family photos, or Carol Payne explaining how Inuit youth learn from their grandparents’ stories… and so on. Every new edition we keep the best from past editions and add at least as many new pieces, so the selection includes old faithfuls and bright new stars.